Here in Newfoundland, it isn’t Easter that promises Spring and its joyously heralded successor, Summer. No, in Newfoundland, when April and May arrive, we recognise with a certain pragmatism, that this is only the beginning of the beginning of waiting for Spring and possibly Summer. Spring is a fickle creature here. It comes and goes, flitting in an out like a casual suitor who always brings flowers, but never stays the night. We all want desperately to believe in it, but no one is quite prepared to bank a flat of tomato seedlings on it. You don’t plant those outdoors until after the first New Moon in June. It’s tradition. After April comes May. In May, the Victoria Day long weekend marks the beginning of The Wait. But we’re not waiting for summer. No siree, we’re waiting for Capelin Weather, that fifth season in the Newfoundland round that marks the precipitous transition from Spring into what we term Early Summer (also known as “Warmer Spring”, for Come-From-Aways). Capelin weather is the point at which all those lessons about “how fog is formed” that you were taught in elementary school come back to haunt you. Remember how you were told about the warm air from the south mixing with the cold air from Labrador and hey presto, Fog. These air currents are travelling above water currents and for reasons of biology and custom, the mixing of these currents signals the onslaught of mating season for capelin; a time for wee fish to throw themselves on beaches and die while laying eggs. While the capelin are an important food and fertilizer source, they are almost more important in that they signal the end of the foggish misery and the beginning of Early Summer. When the capelin have been and gone, we don’t need their weather anymore, so Summer can go right on ahead and start. Last year we got into halfway into Early Summer and never left until September, and then it was only for a week or so. After that we launched right into Early Winter. Last year was a summer of Capelin Weather and it was mightily awful. Cold, damp and foggy, capelin weather is great for fish, but awful for humans. This year we are all hoping the seasons don’t get jammed again. When the whales come, though….. when the whales come it means the capelin are coming and that means hope, no matter how rotten last year was. 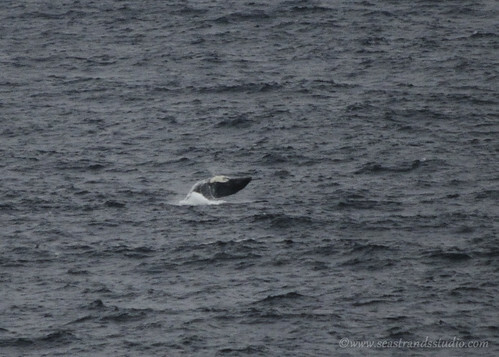 Today, in Flatrock, we spotted a pod of about twenty humpback whales, many of which were very young (we could see their spray size). 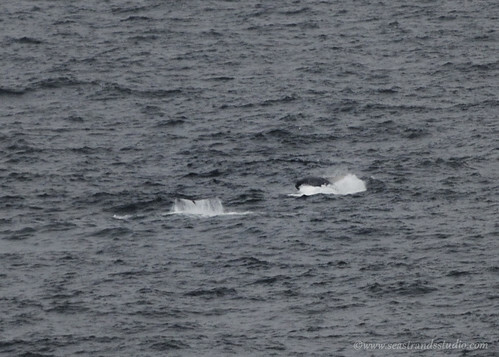 As we were walking along the path, we witnessed two full breaches by adult whales. The pod was obviously feeding, as they hung around diving and whatnot in the same area continuously. We took a few pictures, but I will freely state that these are not fabulous shots. 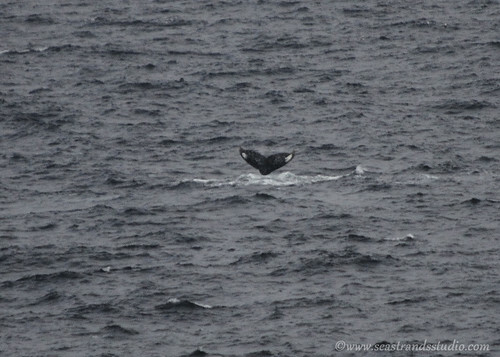 It was a grey evening and the whales were quite far away, insofar as my camera was concerned. In fact, the zoom on the camera was more than I could see with the naked eye. I could see whales spraying all over the place, tails dipping and swooping and, of course, the tremendous splash of the full breaches. In fact, I put down the camera and just watched because there are some things that you just can’t capture on film (er, memory card?) and have to feel and experience. What was truly nifty, though, was what we spotted as we were leaving. We heard a tremendous crashing noise and stopped to look out into the harbour. 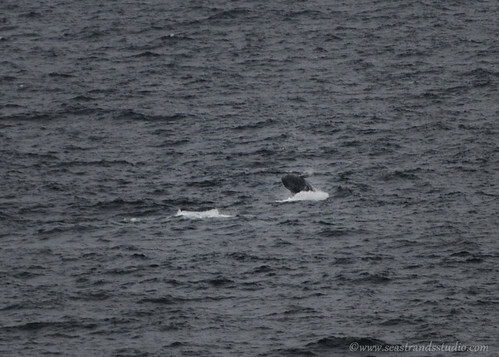 One of the adult whales had split off from the group and was lobtailing. The crash resounded and sounded like the end of a dumptruck swinging to after dropping its load. Over and over the whale crashed her tail and then there was a mighty splash as the adult breached. The adult would thwack the water and then the youngster would follow suit. Not a great shot, but cut me some slack. 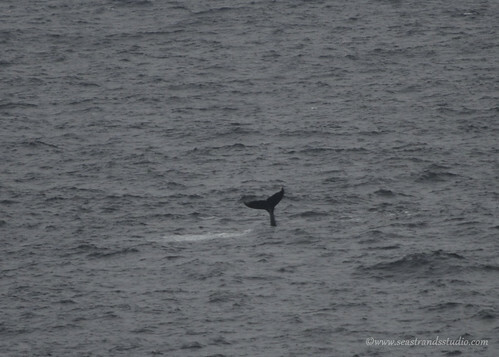 It was a very small whale about a kilometer away. The young one would stick its head up periodically, spyhopping, then go under and attempt a breach. It must have flip-flopped around a dozen times before getting tired and calling it a day. The whole time, the adult was right next to it, as you can see from the tail below. It was pretty neat to watch. 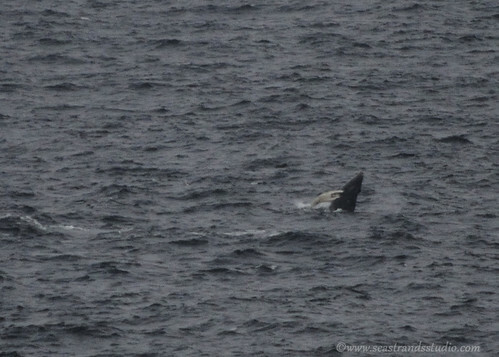 If it had been warmer, I would have stayed longer, since the whales showed no sign of leaving. Must head back again tomorrow and have another look. Exactly. I was just too far away and the conditions were less-than-ideal, but the show was spectacular and breathtaking. Particlarly the Whale School sessions, which I’d not seen before. What a magic moment! No criticism forthcoming from this corner. Amazing. I wish I was there.